I just wanted to share what a LCHF lifestyle has done for me in six months. 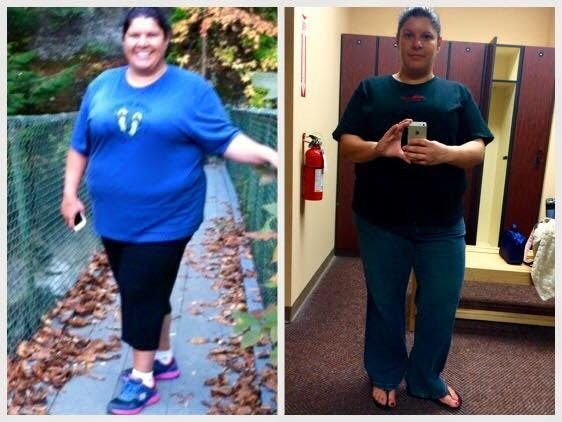 38 lbs (17 kg) lost, PCOS symptoms greatly improved, blood pressure down and signs of inflammation are completely gone! Thank you for the information that you provide on your website!! Many medical and fitness professionals had given me very bad advice for my entire adult life, in part because they didn’t know about or understand PCOS and the impact it has on insulin. Your work in LCHF eating may very well have saved my life. Thank you, sincerely. Congratulations Karen! It really is a shame that people with weight issues and PCOS often get so bad advice, still. We’ll attempt to change that as soon as possible. If you like you can congratulate Karen on Facebook. Email your story to me at andreas@dietdoctor.com. Before and after photos are great for making your story concrete and relatable to other people. Let me know if it’s OK to publish your photo and name or if you’d rather remain anonymous. For those, like myself, who were wondering, PCOS refers to "polycystic ovary syndrome." "Eat heart-healthy foods. This includes lots of vegetables, fruits, nuts, beans, and whole grains. It limits foods that are high in saturated fat, such as meats, cheeses, and fried foods"
Excellent job. Such an inspiration. Thanks for sharing. Some says that PCOs is a women special of metabolic syndrome! I think they have right! Others says that PCOs elevate insulin.. but i think that its hyperinsulinemia that cause PCOs.. at least for moste cases! Excess insulin. Insulin is the hormone produced in the pancreas that allows cells to use sugar (glucose) — your body's primary energy supply. If you have insulin resistance, your ability to use insulin effectively is impaired, and your pancreas has to secrete more insulin to make glucose available to cells. Excess insulin might also affect the ovaries by increasing androgen production, which may interfere with the ovaries' ability to ovulate. Low-grade inflammation. Your body's white blood cells produce substances to fight infection in a response called inflammation. Research has shown that women with PCOS have low-grade inflammation and that this type of low-grade inflammation stimulates polycystic ovaries to produce androgens. Heredity. If your mother or sister has PCOS, you might have a greater chance of having it, too. Researchers also are looking into the possibility that certain genes are linked to PCOS."